Michael Schulson in an photo provided by the Borgata, where he celebrates his 10th anniversary of Izakaya this weekend. 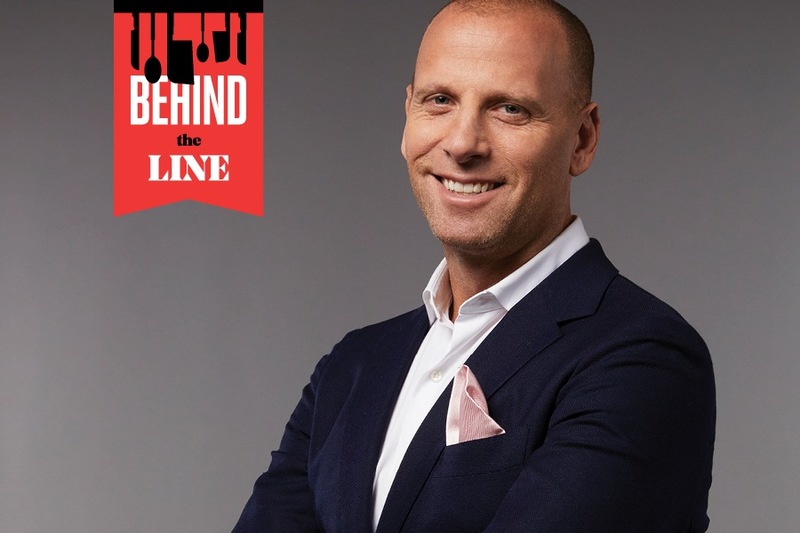 Behind the Line is Foobooz’s interview series with the people who make up Philadelphia’s dynamic bar and restaurant scene. Click here for the full archive. This weekend, Philly chef Michael Schulson celebrates ten years of Izakaya at the Borgata in Atlantic City with a special $100/person dinner. Here, he tells us about working for Stephen Starr, his fondness for simplicity, and why he has such a hard time finding good help in Philadelphia. I grew up in… Long Island. I came to Philly in 1996 for the food world here. In Philly, I’ve worked in… Le Bec-Fin, where I was cutting chives and making salads; Susanna Foo; Buddakan — I was at Susanna Foo and Stephen Starr placed an ad for somebody who cooked Asian food, I applied for it, did a tasting with Stephen, and he offered me chef de cuisine at Buddakan. At that point, he only had Continental. And then I did Pod and helped him out with other restaurants before opening my own. As an employer, Stephen Starr was… tough but brilliant. I live in… Rittenhouse Square. We have two boys, and I love that my building has a pool and that we have one of the best backyards in the city: Rittenhouse Square. My kids go to public school three blocks away at Greenfield. I own… Graffiti Bar, Sampan, Double Knot, Independence Beer Garden, Harp & Crown, Double Knot Sushi, Osteria, Monkitail in Florida, Izakaya at the Borgata, and we are building Giuseppe & Sons next to Harp & Crown, which should open in September, and then we have the steakhouse, which should open in December, right next door to Double Knot. To people who say Philly doesn’t need another Italian restaurant or steakhouse, I say… wait ’til you try mine. 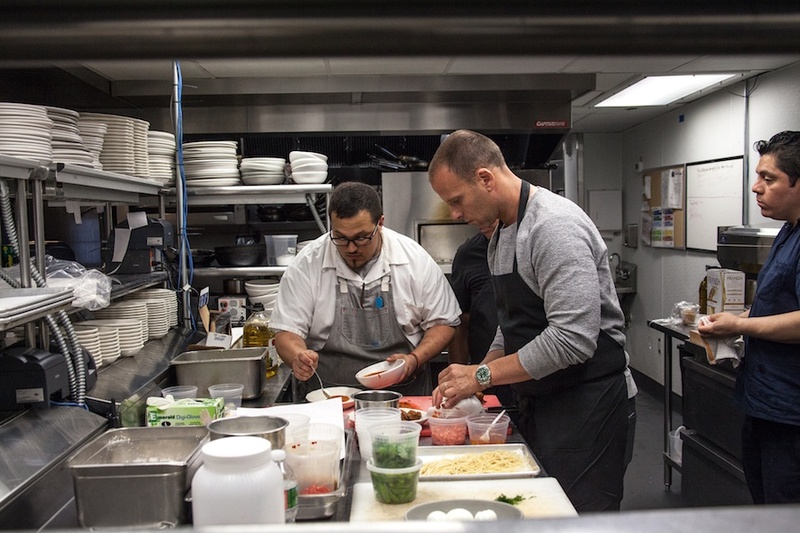 Michael Schulson in the kitchen with Wesley Fields, executive chef of the upcoming Giuseppe & Sons. I love to eat at… ethnic restaurants. I spend a lot of time with my wife Nina, who is a partner in all this, in ethnic restaurants and dives and hole-in-the-walls. We love Tio Pepe, the Portuguese restaurant in Northeast Philadelphia, the Sansom Street Kabob House, which is now on South Street, Nam Phuong, Tai Lake, and Veracruzana on Washington Avenue. If I had to choose between a cheesesteak and a roast pork Italian, I would always go with… a roast pork. At John’s. Actually, I’m changing that answer and saying Mr. Joe’s, which is across the street from Termini’s in South Philly. Oh. My. God. It’s so good. For cheesesteaks, I’d go to Tony Luke’s or Pat’s. My first job was… at Bob’s Big Boy on Long Island. I was 16. My job was refilling the salad stations. I knew I wanted to be a chef when… I watched my Nana cook. My biggest disappointment in life is that she never got to see me in the food world. She used to do stuffed cabbage and kreplach and rugelach and mandel bread, which is like biscotti. Her husband used to own a kosher butcher shop in the Bronx. They didn’t have much money. He used to bring home all these chicken feet, and we’d literally eat braised chicken feet all the time. People say all those chicken feet prepared me for Asian cooking. If you come to me and say you want to open a restaurant, I would tell you… don’t. It’s hard. It’s a lot of work. The last time I had a dine-and-dasher was… just last week at Sampan. They do it all the time. One every two weeks at one of the restaurants. It’s crazy. People do crazy things. The toughest thing about the biz is… the hours. I’m usually in work by 7 a.m. and I try to get home by 9:30 or 10 p.m. But then I’m still working when I get home. There’s just tons of stuff. Opening a restaurant in Atlantic City was… awesome, because I got to be with Bobby Flay, Wolfgang Puck and Michael Mina, who was recently swapped out with Michael Symon, another great guy. The most brilliant thing the Borgata did was build away from the boardwalk and everything else. They created their own entity there. For my last vacation, we went to… Rome, Amalfi Coast, Santorini, and Athens a few weeks ago. It was my first vacation of more than four days in probably ten years. 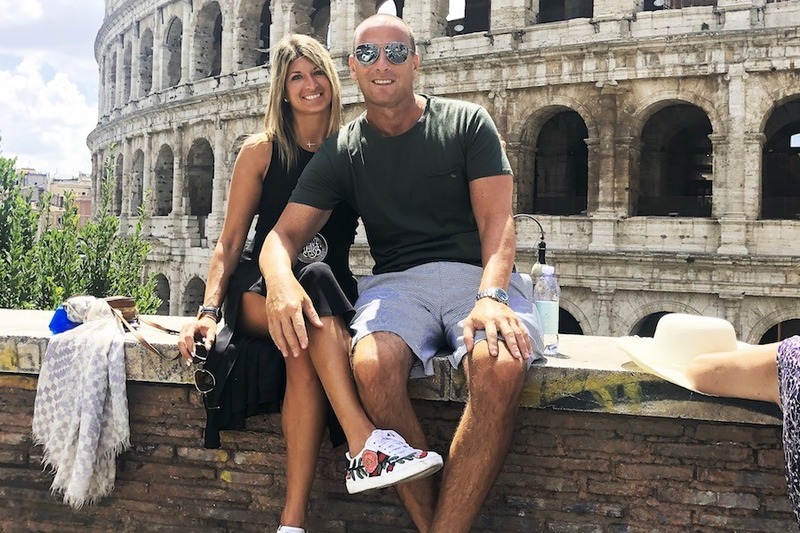 Michael Schulson with wife Nina Tinari in Rome in July. For my kids, I cook… spaghetti and meatballs for Jordan, who is eight, and Davin, who is twelve, only wants steak. Steak, steak, steak, steak, steak, steak. It’s funny. People joke that this year I’m opening an Italian restaurant for Jordan and a steakhouse for Davin. Yelp is… not looking to make friends with restaurants. They’re trying to grow a business. It’s clearly very successful. Is it something I use? No. But I think that with so much social media now, there are so many voices out there. When Yelp was one of the only voices, it had a really strong voice. Now there are so many voices, and theirs got lost a little bit. The biggest difference between the biz today and ten years ago is… finding great employees. People are going to culinary school now because they want to be television chefs. That’s completely different than what it was before. When I was starting out, it was understood that I would work for $8 or $9 an hour and do really hard and long days and it was understood that you had to be passionate about it. Now, so many of these people lack the true passion for food. One restaurant trend I wish would die is… overcomplicating dishes. My favorite burger topping is… really simple: lettuce, tomato and onion on a potato bun. A little ketchup and mayo, and I’m good. The whole “hot chicks” controversy was… blown way out of proportion and what I said was taken the wrong way. The most expensive meal I’ve ever eaten was at… Masa, hands down. It was a year-and-a-half ago. There were four of us. The bill was $3,800, and we literally each had one cocktail and a $100 bottle of sake. The tasting menu started at $600 or something and we did a Kobe supplement and other stuff. One kitchen tool I cannot live without is… a spoon. You can baste with it, turn with it, mix with it, stir with it, plate with it. And you can use it to open a bottle of beer. Owning a business in Philly is… complicated. I love the city. It’s amazing. But I just feel like sometimes we can’t get out of our own way. The biggest mistake home chefs make is… trying to do too much. Just learn how to roast a perfect chicken. Sear a perfect steak. Don’t worry about caramelizing this and braising that and poaching this and pickling that. Some of the best food you can eat in the world is literally a perfectly roasted piece of chicken. Ten years from now, I will… have 30 restaurants. I have a new project on Locust I’m working on — I don’t know the concept yet, but it’s right next door to Parc — and we’ll be at 13 restaurants by early 2019. So in ten years, another 17? Why not?